"By the time we knew it, there were no routes out." 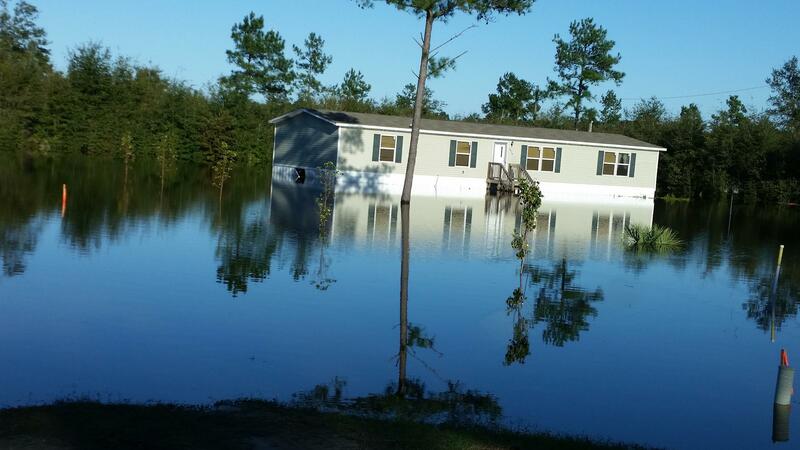 Nichols Resident Shares Evacuation Experience. Some Nichols residents were evacuated by boats. Many South Carolinians may not have heard of the town of Nichols prior to Gov. Nikki Haley's October 10th press conference. The small town is in Marion County and has a population of about 400. Those watching that update, learned that more than half of the town's residents were rescued from the third floor of the town hall. Nichols was flooded from rising waters from the neighboring Lumber River. 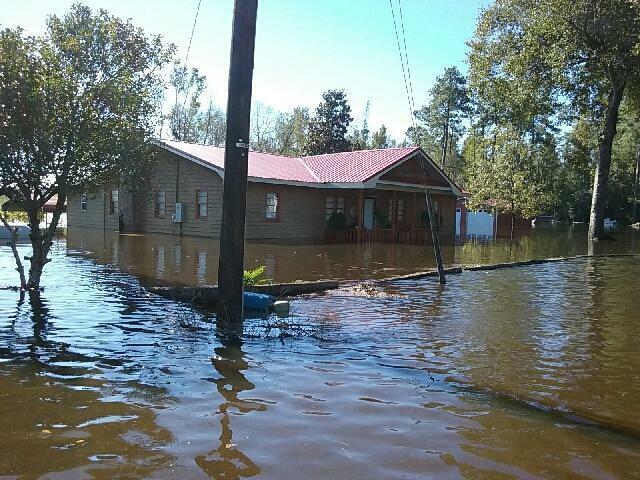 South Carolina Public Radio's Thelisha Eaddy talks with a resident about how he and his family were taken to higher ground. Hurricane Matthew made landfall Saturday, October 8. The Category 2 storm brought floods and strong winds to the coastline of South Carolina and North Carolina. It poured rain and brought a dangerous storm surge. The storm made landfall near the town of McClellanville. 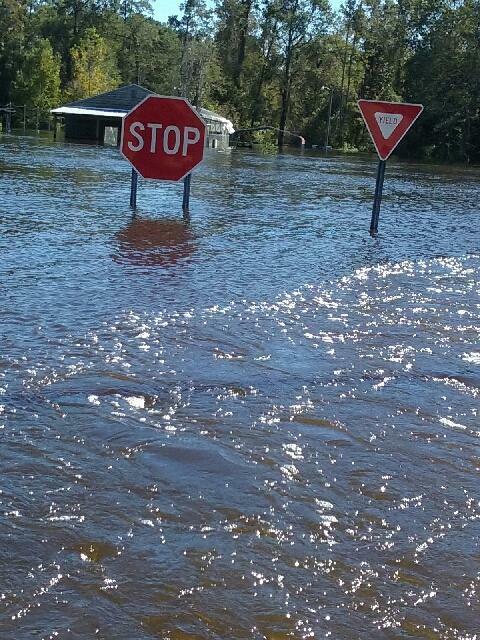 100 miles away, residents in the small town of Nichols, would experience feet of post-storm flooding. Nichols resident Courtney Wilds said he and his family noticed flood waters rising, but wasn't exactly sure what to do. "We noticed in my aunt's backyard, across the street, that it kept rising. They had cut the forest down behind my house. So the water had no where to run." BEFORE and AFTER: A section of main street in the town of Nichols. Photos provided by resident Courtney Wilds and Google Earth. After Hurricane Matthew, Gov. Haley and her team updated residents on conditions throughout the impacted areas. During her October 10th address, the Governor said as swollen rivers in North and South Carolina start to flow, there is massive flooding in several areas including Florence and Marion County. Wilds and his family were evacuated to a shelter in Mullins around 3AM on October 10th. He said some people were rescued by heavy duty truck as well as boats and eventually put on school buses. 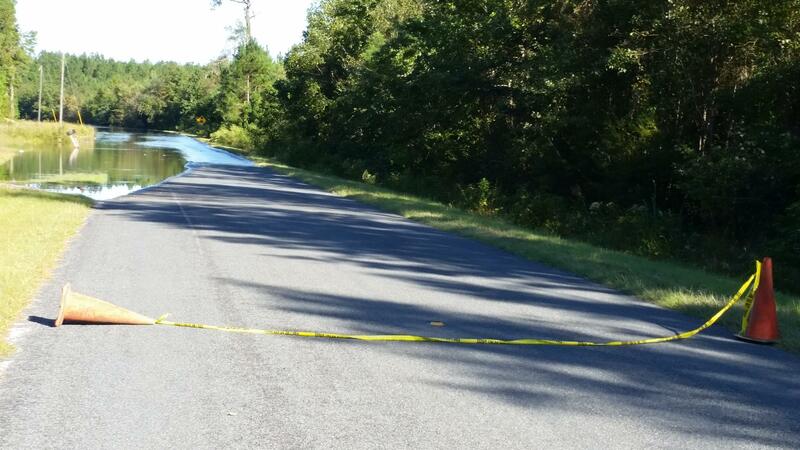 Cynthia Woodberry lives on Sonny Road in the Britton’s Neck community of Gresham, 30 miles South of Nichols. Around 3:30PM Monday, she said a local police officer told her it was time to leave. Woodberry was referring to the Little Pee Dee River, 116- mile tributary of the Pee Dee River. She said five houses from hers, yards were flooded. During Gov. Nikki Haley’s press conference, earlier that day, Dept. of Natural Resources Director Alvin Taylor said their concern and efforts were on the Little Pee Dee River, from the Nichols area, all the way down to the Great Pee Dee. Woodberry said her family’s plan is to return to the hotel. In response to Governor Nikki Haley’s request, President Barack Obama declared a major disaster exists in the State of South Carolina and ordered Federal aid to supplement state and local recovery efforts in 13 counties most severely affected by Hurricane Matthew. The Federal Emergency Management Agency Public Assistance Program helps reimburse local governments, state agencies, eligible private non-profit organizations and electric co-operatives for certain expenses they have incurred. Federal disaster aid is not available for individual residents at this time. On October 10, Governor Haley formally requested a disaster declaration from the White House for Beaufort, Berkeley, Charleston, Colleton, Darlington, Dillon, Dorchester, Florence, Georgetown, Horry, Jasper, Marion, and Williamsburg counties. Her request followed an assessment of damages by representatives of the South Carolina Emergency Management Division, the Federal Emergency Management Agency, affected electric co-operatives, and local and municipal governments. From volunteering services to donating food and clothing, the South Carolina Emergency Management Division website has detailed information on ways to donate and help victims of Hurricane Matthew.